The best graphics design work is often the most simple one. 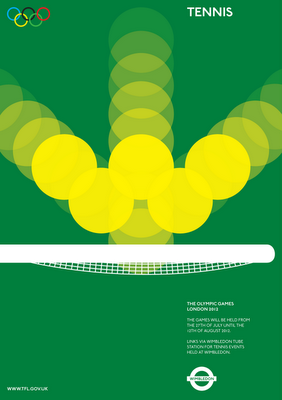 Noisy Decent Graphics pointed to these beautiful Olympic posters designed by student Alan Clarke. (They were not adopted by the organizers of the Olympics though). The bouncing ball in the tennis poster gave me inspiration for a concept that I can use in PowerPoint charts. Semi-transparent circles (with different levels of transparency) flying over the screen are great to show movement. Be sure to remember the law of reflection though, :-).